Lust for eggs no longer. This vegan, veggie frittata made with garbanzo bean flour tastes amazing. 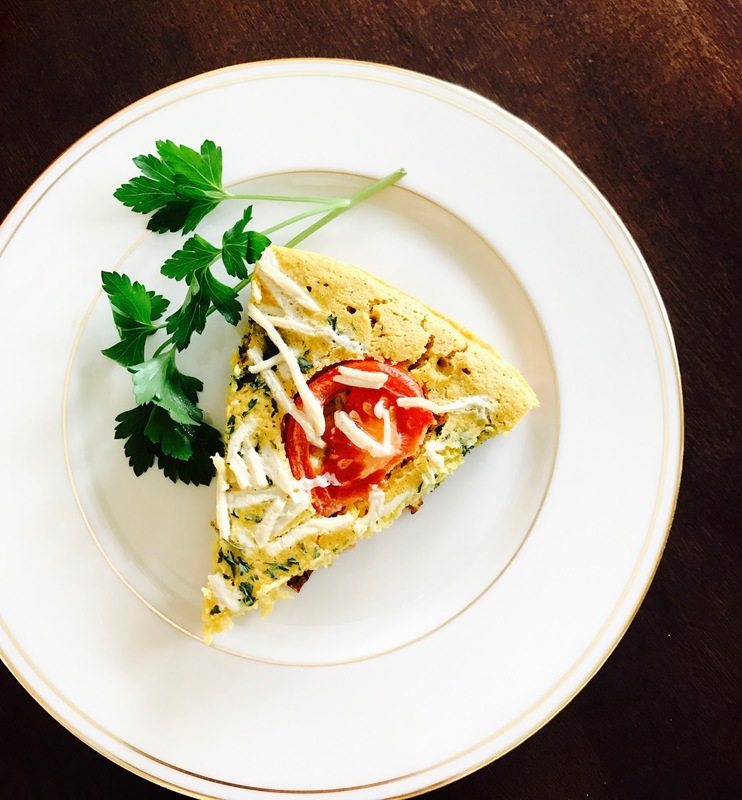 During all those years I was vegetarian (starting in 2004,) I didn't crave eggs as much as I thought I would, but every so often I'd come across an omelet or frittata recipe that I just had to make. Then, in the summer of 2015, I decided to shift to a vegan diet (mostly to work on some minor health issues that had started to crop up,) so eggs were no longer on the shopping list. 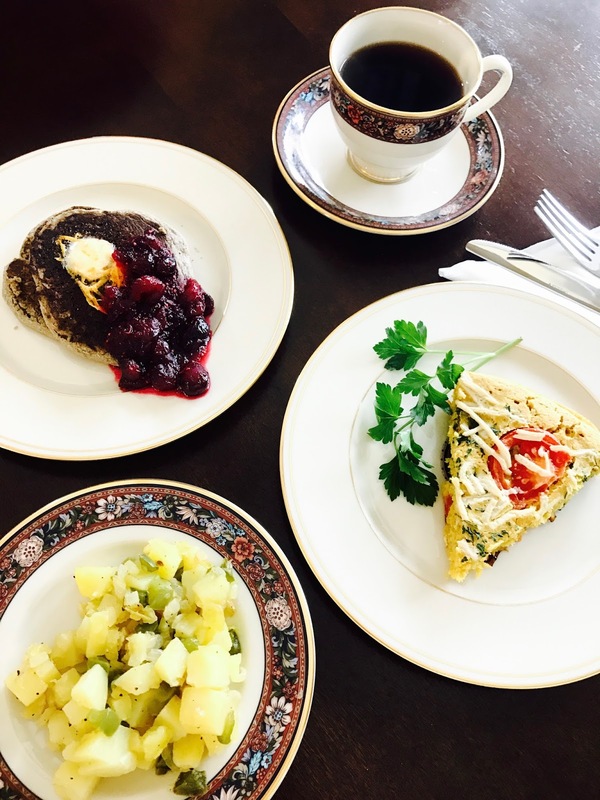 No biggie; I had other vegan breakfast items to eat--I mostly relied on hot cereals like brown rice farina, oatmeal, and buckwheat, and would occasionally make vegan scones, biscuits, or muffins. Only problem is, it's hard to feel like you're having a weekend "brunch" with only hot cereals and vegan baked goodies. So, a few months ago, I started experimenting with using garbanzo bean flour, turmeric, and veggie broth to make eggless scrambles. The scrambles were delicious, but at best I'd only have three servings total (two leftovers,) which didn't give me very many weekdays' worth of easy, pop-it-in-the-toaster-oven breakfasts. I tried just making bigger scrambles, but they would take forever to cook in my iron skillet due to not having enough contact with the bottom of the pan. So, I decided to try making a frittata instead, since it could bake in the oven as one big piece rather than me having to stir, wait, and turn it over and over to get all the batter to cook. This frittata is easy to make, provides me with at least 6 slices which store great in baggies in the fridge and reheat deliciously wrapped in foil in the toaster oven (I heat one slice at 400 degrees for 20 minutes.) 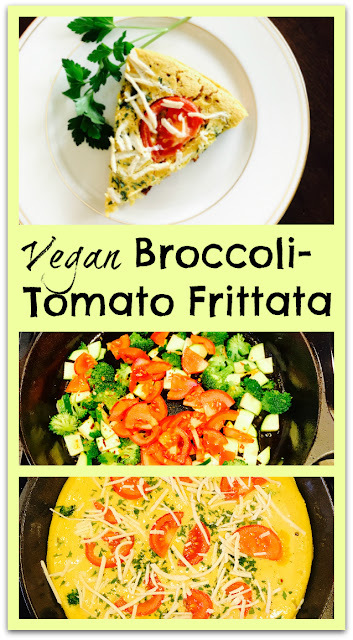 I like to make it with broccoli and tomatoes, and I usually add yellow squash or zucchini, but you could use almost any combination of veggies and have a delicious brunch dish that won't leave you wishing for eggs. Also, if you haven't found a vegan cheese you like, no worries. This frittata is equally delicious without it. I also love to serve it with a side of chopped fresh tomato and/or avocado. Preheat oven to 350 degrees. Heat 1 TBS olive oil in iron skillet (or other oven-proof skillet. If you don't have an oven-proof skillet, make sure you have a greased pie pan or baking dish you can use to put the frittata in the oven.) Saute the garlic slices until golden brown around the edges. Add the broccoli and red pepper flakes and saute for 1 minute. Pour in 2 TBS water, cover, and steam it 2 minutes. Add the zucchini and continue cooking another couple of minutes, then add the sliced tomato. Cook this down until the tomato starts to break up and become saucy, about 5 more minutes. Season with salt and pepper. For the batter, combine the dry ingredients, then whisk in the veggie broth until smooth. Pour the sauteed veggies into the batter and stir to combine (you can also just pour the batter over the veggies in the iron skillet; just know that the veggies will form a layer on the bottom of the frittata. Still tastes great!) Heat the other TBS of olive oil in the iron skillet and pour in the frittata mixture. Garnish the top with parsley, sliced tomato, and a small handful of vegan cheese, if desired. Cook over medium heat until set around the edge (it will start to look dry as it cooks.) If you don't have an oven-proof skillet, you might want to skip this edge-cooking step, place the frittata mixture directly in your pie pan, and just cook it longer in the oven. Transfer the iron skillet to the heated oven and bake the frittata until the center is set, about 15 minutes. Let rest about 5 minutes before serving, and enjoy! Sunday brunch featuring my broccoli-tomato frittata along with buckwheat pancakes, cranberry compote, and fried potatoes...yum!